Most on the Outdoor Pools in Germany offer both open lanes for independent swimming and also guided activities like water aerobics or aquabike. Swimia.com needs your feedback to ensure all the information is valid, since maybe this pool is no longer open towards the public. Swimia.com has the most up-to-date database about Swimming Pools. Please contact the facilities to check which activities are offering and their timetables. These are the Outdoor Pools in Germany other users have reported. Are you a local and your pool is not listed? Contact us to ADD IT. It's cost-free! Regular users told us essentially the most important thing of swimming would be to control your breathing. To acquire this, our head will need to be aligned with our spine all the time. Let us tell you a secret to switch off even though you are in Hamburg: just choose a Swimming Pool in Hamburg and plunge into the water! There's no more powerful method. Without a shadow of a doubt, swimming in Stuttgart is the best strategy to unwind after work. 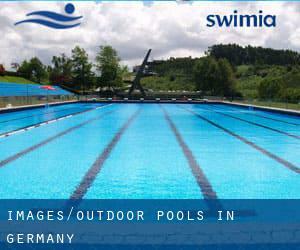 Take a couple of minutes to browse Swimia's catalog to find a Swimming Pool in Stuttgart. It's difficult to visit Germany without dropping by Munich (with 1.260.391 residents). Currently Swimia is showing you all the Swimming Pool in Munich along with the closest pools located in its vicinity. Swimming is a exceptional thought to keep your body active in the course of your visit to Frankfurt am Main (Germany), or even should you be a local. Swimia assists you to locate your closest Swimming Pool in Frankfurt am Main. Holding an estimated population of 593.085, Essen is one of the most important cities in Germany. Check all the Swimming Pool in Essen and its surrounding area. Updated on 2019 Postillonstrasse 17 , Munich (Postal Code: 80637). Among all the activities offered by the center, if you are thinking about swimming you will get pleasure from Olympic size, 8 lanes, Outdoors. If you might want to contact this Swimming Pool, email address and phone number are both number. Updated on 2019 Am Stadtbad 2 , Delmenhorst (Postal Code: 27753). Swimmers like you have reported 25 meters, 6 lanes, 1.1 meters - 1.8 meters depth, 1.1 meters - 1.8 meters depth, Indoors. Also, you will find 25 meters, 4 lanes, Outdoors. If you must make contact with this Swimming Pool, email address and phone number are both number. Updated on 2019 Bückelhaube , Gruenstadt (Postal Code: 67269). Among all the activities offered by the center, for anybody who is interested in swimming you may take pleasure in Olympic size, 6 lanes, Indoor/Outdoor. Just in case you would like to get in touch with this Swimming Pool just before dropping by, we only know the phone number. Updated on 2019 In the SI-Centre , Plieninger Strasse 100/1 , Stuttgart (Postal Code: 70567). This sports center offers 20 meters, Indoor/Outdoor. Contact information for this Swimming Pool similar to phone number and email address are number. Updated on 2019 Händelstraße , Kronenberg , Aachen (Postal Code: 52074). Swimmers like you have reported 25 meters x 12.5 meters, 6 lanes, 1.8 meters depth, 1.8 meters depth, Outdoors. Also, you will find 17 meters x 14 meters, 4.5 meters depth diving well, 4.5 meters depth diving well, Indoors. Just in case you want to contact this Swimming Pool just before dropping by, we only know the phone number. Updated on 2019 Bürgermeister-Cornell-Ring , Ahlen (Postal Code: 59227). Swimmers like you reported Olympic size, Outdoors. Phone number and e-mail address are number for this Pool. Updated on 2019 Nassauer Allee , Schlangenbad (Postal Code: 65388). This sports center delivers 30 meters, Outdoors. For this Swimming Pool, only phone number is number here. Updated on 2019 Mühlendamm 17d , Elmshorn (Postal Code: 25335). Swimmers like you reported Olympic size, 8 lanes, Indoor/Outdoor. Phone number and e-mail address are number for this Swimming Pool. Updated on 2019 Am Hexenbuckel 1 , Boeblingen (Postal Code: 71032). This sports center provides 20 meters, Outdoors. Contact information for this Swimming Pool just like phone number and e-mail address are number. Updated on 2019 Talstrasse 120 , Neustadt an der Weinstrasse (Postal Code: 67433). Swimmers like you reported Olympic size x 25 meters, 10 lanes, Indoor/Outdoor. Phone number and e-mail address are number for this Swimming Pool. Updated on 2019 Eichenstraße 4 , Berlin (Postal Code: 12435). This sports center delivers 28 meters x 6.5 meters, 2.08 meters depth, 2.08 meters depth, Indoor/Outdoor. Contact knowledge for this Swimming Pool such as phone number and email address are number. Updated on 2019 Lachener Weg 175 , Hassloch (Postal Code: 67454). This great and large sports center lets professional swimmers like you enjoy 25 meters x 12 meters, 4 lanes, 1.3 meters - 1.8 meters depth, 1.3 meters - 1.8 meters depth, Indoors. Additionally, within these facilities you can try 25 meters x 20 meters, 8 lanes, 1.3 meters - 2 meters depth, 1.3 meters - 2 meters depth, Outdoors. Phone number and e-mail address are number for this Swimming Pool. Updated on 2019 Berliner Platz 1 , Ludwigsburg (Postal Code: 71638). This great and large sports center lets professional swimmers like you enjoy 25 meters x 16.5 meters, Indoors. Additionally, within these facilities you can try 24 meters x 12 meters, Outdoors. Unfortunately we do not have the email address of this Pool, but we can give you the phone number. Updated on 2019 Altenritter Strasse , Baunatal (Postal Code: 34225). Swimmers like you reported 25 meters, 6 lanes, 2 meters - 3.8 meters depth, 2 meters - 3.8 meters depth, Indoor/Outdoor. Phone number and e-mail address are number for this Swimming Pool. Updated on 2019 Goernestrasse 21 , Eppendorf , Hamburg (Postal Code: 20249). Among all of the activities provided by the center, in case you are interested in swimming you will enjoy 25 meters, Outdoors. If you will need to contact this Swimming Pool, e-mail address and phone number are both number.